Mahak is using Smore newsletters to spread the word online. My cousin, Aishwarya has an eye illness called myopia. This illness makes the number of your eyes worsen over the years. So I decided to ask her to tell me her eye prescription, an according to her prescription I researched another. One who has myopia over the age of 16, know that their number steadily increases, by a specific interval. So I decided to compare my cousin's and another person's eye number for their myopia. The data is recorded over the course of ten years, and it shows the steady decrease in each person's number over those years. The following data is part of eye glasses prescriptions written by the optometrist for Aishwarya and an individual with myopia. The data table, at the top shows the decrease in the Aishwarya's eye number. Whereas, the data table, at the bottom, shows the decrease in the second individual's eye number. The independent variable is Number of Years When Glasses are Used. The dependent variable is The Eye Number During That Year. 2. 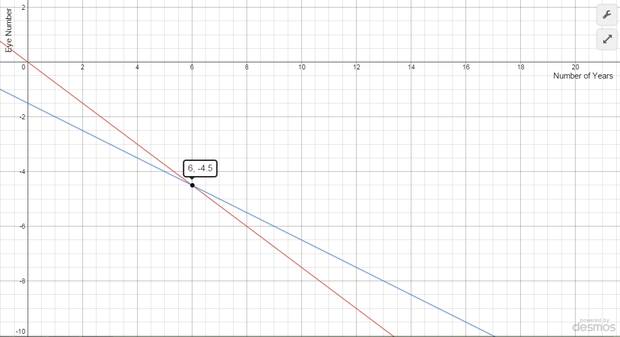 The first difference of -3/4 is the slope, so that is value of m.
3. The value of b is 0, so there is no b value. Using this information, we can use it to create the equations. The equation in the form of y-intercept and slope is y = -3/4x. The standard form for this equation would be 3x + 4y + 0 = 0. 2. The first difference of -1/2 is the slope, so that is value of m.
3. 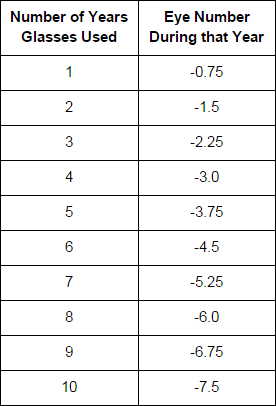 The value of b is -1.5, so that is the value of b. The equation in the form of y-intercept and slope is y = -1/2x - 3/2. The standard form for this equation would be x + 2y + 1.5 = 0. 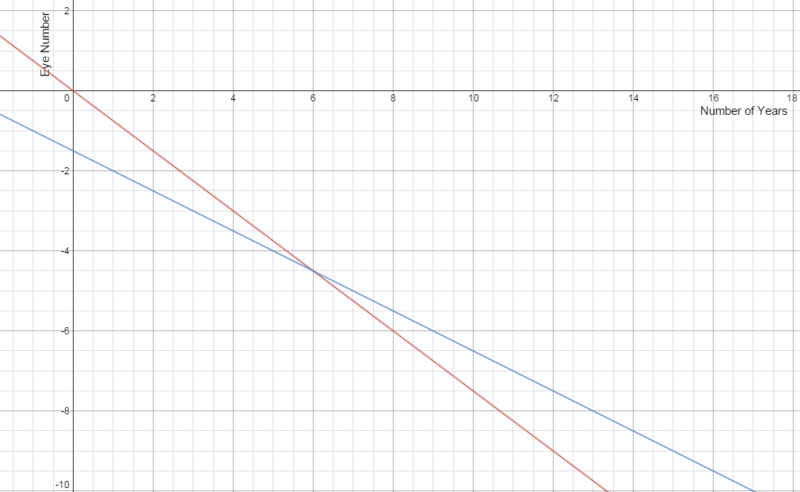 The following is a graph which illustrates the not only illustrates the equations but shows a line of best fit for each so that the trend can be seen. The red line, the direct variation, represents Aishwarya's equation for her eyes, whereas the blue line represents the individual's. The second proof of the intersection being (6, -4.5) is by using substitution and the form of y = mx + b, to prove the intersection is what it is. 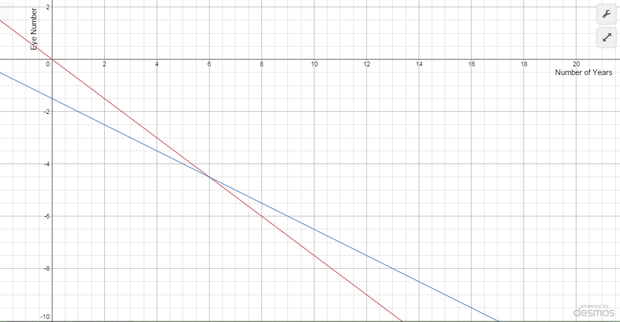 To do so, for each equation for each line, 6 will substitute x as its value and -4.5, will substitute y for its value. As the two sides equal to each other, it means that this point surely runs along this line. The significance behind the intersection is that both of these people will have the same eye number during their 6th year of wearing glasses so that they are able to see. Their eye number during that year was -4.5. Before the lines intersected, before and until their sixth year of wearing glasses, the individual's eye number was worse than Aishwarya's as it was much more decreased. But after the lines intersected, and after their sixth year of wearing glasses, Aishwarya's number turned out to be higher than the individual's as her was decreasing at a rapid pace per year in comparison to the pointed out individual. Aishwarya and the individual both had the same eye number which is -4.5 during their sixth year of wearing glasses. The significance behind the topic of this flyer is to inform one about the seriousness of the illness, myopia, and the toll it can take on a person's eyes. The effect of myopia is that the number of one's eye increases rapidly, and that it can lead to blindness. Currently, my cousin's eye number is in between -9 and -10. Much worse than this can occur and has occurred to some individuals or is occurring to them currently. My goal was to inform you of this illness and let one see what can happen to someone with myopia. If you want to know, imagine this, everything for you is completely blurry, only strange blobs or colour or even darkness can be seen. This is what they see every time they don't have their glasses or contacts on.